State Representative Blaine Wilhour (R-Beecher City) today is issuing the following statement on the far-left policies outlined by Gov. JB Pritzker and the hostile rules the House Democrats have enacted in the IL House of Representatives. “We were told from the outset that there would be a bipartisan effort to solve the State’s problems. So far, this has not been the case. Instead of bipartisanship, we are getting nothing but far-left legislative proposals and executive orders. There has been little respect shown for our way of life and the values we share here in southern Illinois. What we have seen is a full-on assault on the First Amendment, Second Amendment and the Right to Life. Rest assured, I will stand firmly against these measures. I came to Springfield this week with the intent to work, but our only significant action was to approve the House Rules for the 101st General Assembly. 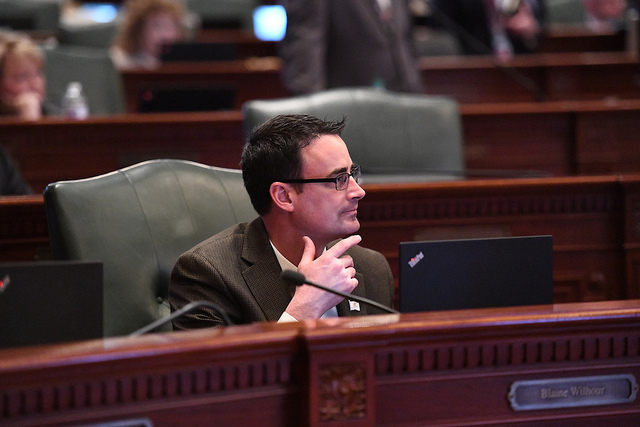 Once again, House Speaker Michael Madigan is using the House Rules to restrict common sense legislation and to exact total control over the House Chamber. The Republican Caucus put forward some common-sense amendments to the rules to increase transparency, create more cooperation in problem solving and to ensure that all members – Democrats and Republicans – would have a voice for their districts. Not a single democrat supported these measures and so, we will have more of the same as the House Speaker will once again have the power and influence. The actions taken in the House will only serve to make it more difficult for us to focus on what matters – the budget. We need to trim the budget to a level that we can afford and put a mechanism in place that will not allow spending to grow at a faster rate than our economy. That is why I am supporting and co-sponsoring my colleague State Rep. Steven Reick’s legislation (HB 275) to create a Commission on Fiscal Responsibility and Reform modeled after President Reagan’s Grace Commission. The Commission would be comprised of an 18-member board of private sector appointee’s tasked with doing a deep audit and review of executive branch state agencies and report their findings and recommendations for improvement and increased efficiency to the Governor and the General Assembly.